Five lost theatres, one address. This photo taken at 615 K St. is from April, 1937. This was the site of the second location of The Unique Theatre 1905-1906. The Alisky Theatre opened in the same location 1906-1908, next, The Pantages, May 1908-1913, to be followed by the Garrick T & D (Turner and Dahnken, locals called it “tired and dirty”) 1913-1923. 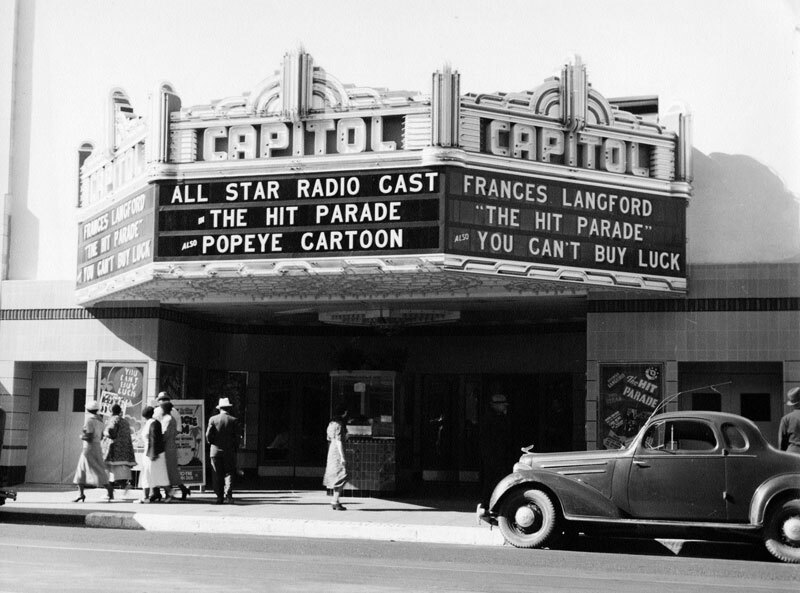 On August 18, 1923 it opened as the 1,177 seat Capitol. It broke local box-office records when The Son of the Sheik played there in August of 1926. The film’s star Rudolph Valentino had tragically died the week before. Vitaphone was installed in March of 1928 and the first sound feature hit, The Jazz Singer was shown. The same programme featured the sound Movietone News of Lindberg’s landing in Paris. Demolished in 1957, this spot is now the east end of the Westfield Downtown Plaza.